The Short Version: The Norwegian director of the wholly overrated DEAD SNOW (2009) goes for broke with this braindead, anachronistic splatter fest that's as candy coated with entertainment value as the Gingerbread House featured in the film. Heads roll, bodies explode, spells are cast and many a dirty word are uttered in this infinitely stupid, but wholeheartedly fun 90 minute programmer that flies by as speedily as any of the broomstick traveling witches in the movie. 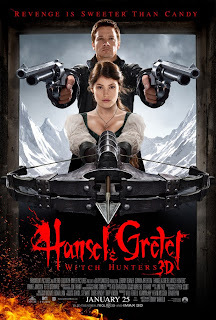 H&G feels like an overture to a bigger piece of medieval operatic goofiness aided and abetted by a great score laced with a Euro metal style and heavy orchestral cues from Atli Orvarsson and Hans Zimmer. The hand of Sam Raimi also looms large over this fun, foreboding and fractured grim fairy tale. Abandoned by their parents as small children, Hansel and Gretel are enticed into a Gingerbread House deep in the woods. Escaping the cannibalistic clutches of the witch after burning her alive in her own oven, the two grow up to become bounty hunting witchfinders. A rash of kidnapped children brings them to the village of Augsburg where they eventually cross paths with Muriel, a powerful sorceress. 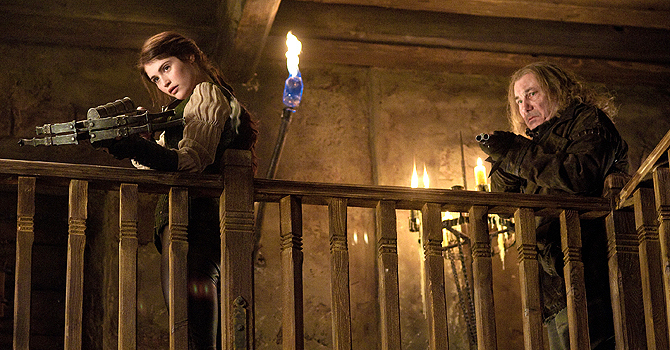 The two siblings soon learn their mother was a white witch burned at the stake the night they were abandoned. 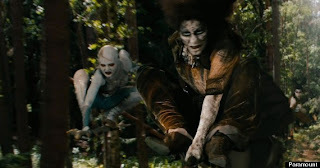 Being the daughter of a white witch, Gretel's heart is coveted by Muriel for use in some arcane ritual whereby the organ is the prime ingredient in a potion that will make all witches impervious to fire on the night of the Blood Moon. Ever since first reading the Brothers Grimm stories in grade school, the one that always fascinated me the most was Hansel and Gretel. The idea that a forest dwelling hag lures small children into her candy-coated hovel for the sole purpose of eating them struck a chord within my young, morbidity scorched psyche and has remained there all these years later. Norwegian director Wirkola has concocted a frenetically paced, visual heavy, but plot-light splatter action spectacle with midnight movie potential. There's close to an hours worth of filler before anything resembling a plot begins to surface. 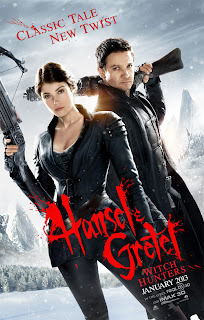 For the first 50 minutes or so, it's basically Hansel (Renner) and Gretel (Arterton) going from one set piece to the next encountering, and doing battle with assorted witches defined by their crooked, demonic features and glowing yellow eyes. Occasionally these moments are pock-marked with plot points revealing something about a 'Blood Moon' ceremony that will make all of witch-kind impervious to fire. By the time this is revealed, the movie is almost over. The viewer has been hit over the head with so much ghoulish imagery and near constant action, the emergence of any narrative focus feels like an afterthought. This may put off some viewers, but if you're a fan of such anachronism fantasies like KRULL (1983), or even the hugely influential 'James Bond in the Old West' 1960s series THE WILD, WILD WEST (1965-1969), you'll likely enjoy this movie strictly on an entertainment level, and that's all that the filmmakers seemed to be geared towards with this movie. Regarding the intentional chronological and historical discrepancies, these are given as much of an oldeworld flavor as possible. But once all of the medieval pump action shotguns and gatling guns begin unleashing hell on the cast of conjurers, the world Wirkola has devised resides as far away from the realm of reality as you can get. 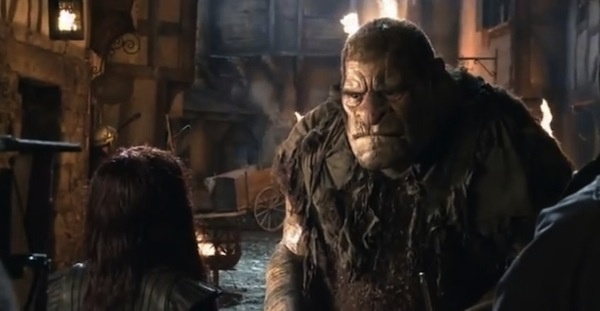 There are also modern style accents and expletive heavy dialog, which comes off as R rated versions of the popular HERCULES and XENA television programs from the 1990s. 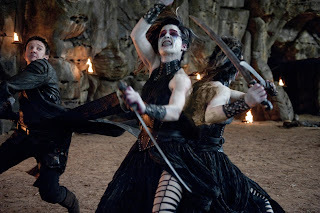 This world of the 'Ultra-Fantasy' was also tapped in the two KIBAKICHI (2004) samurai-monster-fantasy movies from Japan with its black leather clad, modern weapon wielding bounty hunters. I use the term 'Ultra-Fantasy' to describe a scenario where the limits of the most minor of historically accurate details are stretched beyond the point of even fantasy believability. 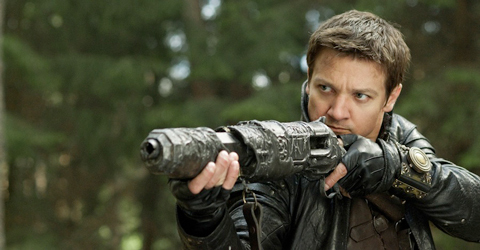 Considering the original tale likely takes place somewhere within the Middle Ages period, it's safe to say skin-tight leather trench coats, gadget infested crossbows and modified defibrillators were also hard to come by back then. The elaborate bladed weaponry, while possessing a medieval look, appears straight out of any number of Shaw Brothers wuxia-kung fu pictures. There's also some form of medieval diabetes that one of our heroes battles with and must take insulin shots for (although these aren't called diabetes and insulin, but something else considering this is somewhere around the 14th century). The action choreography has a Hong Kong feel to it, and the action design and execution exudes a Sam Raimi influence; himself adopting a HK style to his later filmic output. It's difficult to watch the forest chases, arrows, darts and knives flying at the screen with rapidity and not think of Raimi, his Evil Dead, or the hysterical nature of his camera movements. The 3D photography (some during and some post production) works extremely well here. The opening ten minutes alone has more 3D than the average three dimensional flick in its entirety. The 3D is so plentiful, this too brings such 70s HK 'comin' at ya'' fists and kicks fests like DYNASTY (1976) and 13 GOLDEN NUNS (REVENGE OF THE SHOGUN WOMEN ) to mind. Wirkola uses the technology to great effect here. It heightens the abrasively colorful atmosphere represented via the dark fairy tale quality art decor set in and around a forest that literally comes alive serving as a weapon itself for the witches and title bounty hunters alike. That old fairy tale conceit of witches flying on broomsticks (or any sort of twisted tree limb they can get their hands on) is a nice touch as are the wands they wield (Apparently the wands of good witches emit red and bad witches blue beams of electrical destruction). The flying sequences, especially the one towards the end, recalls the forest chases in RETURN OF THE JEDI (1983). The whole enterprise brings to mind another Grimm Fairy Tale, the even darker 1997 Made For Cable horror picture, SNOW WHITE: A TALE OF TERROR starring Sigourney Weaver and Sam Neill. The Snow White tale likewise received its own revisionist fantasy do-over last year with the release of SNOW WHITE & THE HUNTSMAN (2012). 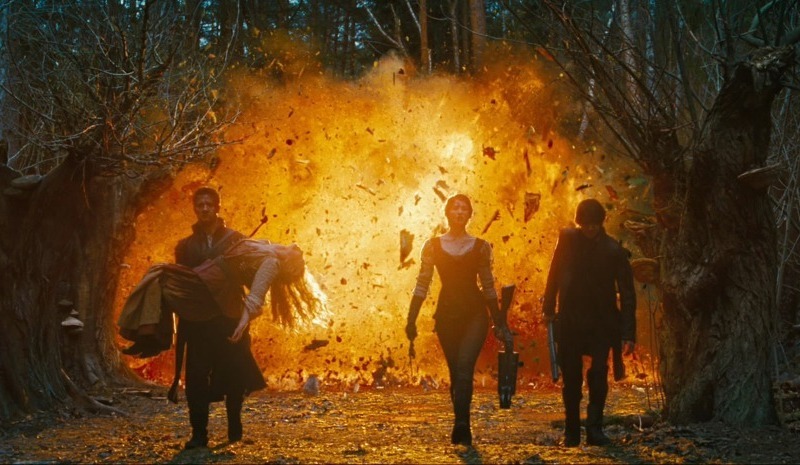 The performances of HANSEL & GRETEL are standard comic book personas and are summarily drowned out amidst endless scenes of flying arrows, daggers, blood and bodies. The energetic musical score, peppered with metal and orchestral, vies for equal attention. 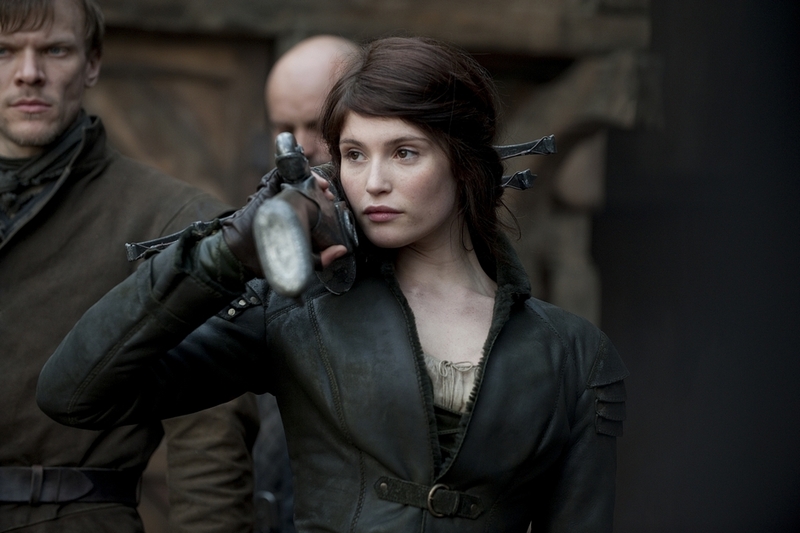 Jeremy Renner (Hawkeye from THE AVENGERS) and Gemma Arterton (Io from the awful CLASH OF THE TITANS remake) both look good and accost themselves well in their roles. 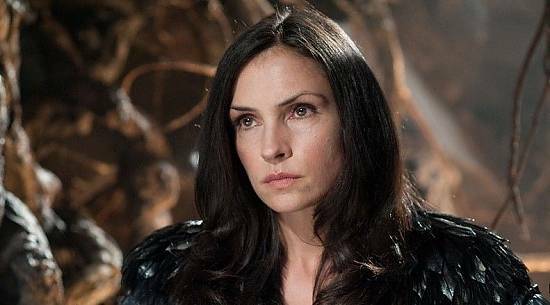 The same can be said for Famke Janssen as top witch woman Muriel; who slinks her way through the supporting cast to get at Gretel in an attempt to remove her heart for the Blood Moon ceremony. There's little else to be said about anybody's performances although I found myself occasionally bewitched by Janssen's looks (when she isn't transformed into her true witch form) as well as Arterton's lips, which should have gotten a separate screen credit. 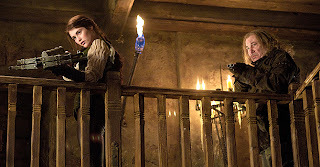 Everybody does just fine in this live action comic book, but even if dialog was delivered in a somnambulistic fashion, it wouldn't matter as the fantasy is the star of the show. Strangely enough, the inclusion of a lovable, if powerful troll named Edward (played by Derek Mears of 2009s FRIDAY THE 13TH) garners more audience sympathy than any of the human characters. Had more attention been paid to plot and exposition, this might have risen above 'B' movie conventions. Still, Wirkola's movies seems content embracing the fact it's nothing more than a popcorn, candy and coke flick meant to be savored for what tastes good, and not at all for its nutritional content. 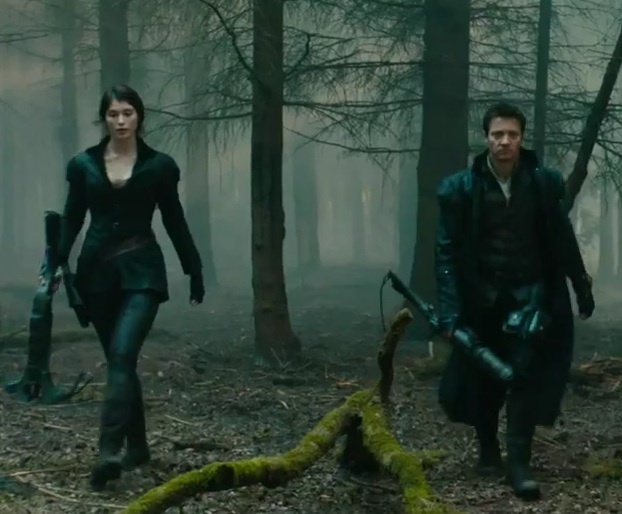 HANSEL & GRETEL is arguably the closest thing to a midnight movie I've seen in quite some time. If more of them are made, hopefully they retain the defiantly incongruous ambiance and misplaced banter this one possesses -- and hopefully under the guidance of this pictures director. Wirkola's debut American production could very well become the rebellious, Gothic answer to the more mannered, reigning champion of geekdom, THE LORD OF THE RINGS series.